This year there seems to be a lot of hype surrounding the World Cup Soccer in Brazil. Are you caught up in the hype? I get caught up looking at all the colors and patterns at soccer matches as well as the well trained athletes. I have friends who are participating in pools as to which team will win as well as setting the DVR so that they do not miss any of the games. I'm 100% for our US World Cup Team and love watching them play. All my girls were soccer players and I always loved watching them play, too. Are you cheering for Team US? Are you a Super Fan for the US World Cup Team? This post is sponsored by Global Influence and my own personal opinions are expressed here. I'm excited to share a super fan deal with you this summer involving Degree Men and Walgreens! They are celebrating and cheering on the US Soccer Team. Did you know that Degree with MOTIONSENSE is the Official Deodorant of the US Soccer Team? The new and improved Degree MOTIONSENSE is the only antiperspirant that releases extra protection when you move it for up to 48 hours! Amazing and I can't wait to pick up some of this for my family. Because of this, Degree wants to reward fans who do more, move more and cheer more this summer! 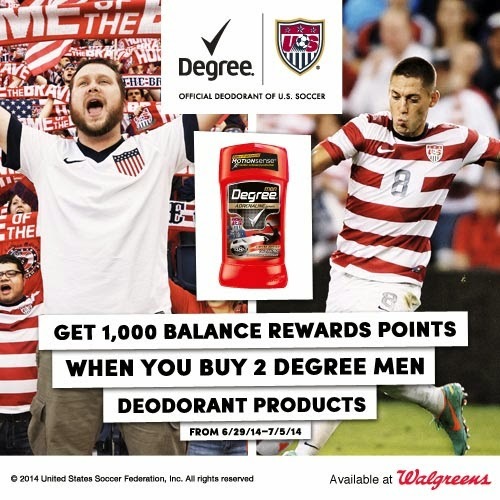 Head in to Walgreens 6/29-7/5 and get your 1,000 Balance Rewards points when you buy 2 Degree Men Deodorant products! Nice deal, right? I hope you have an active summer planned and keep cheering for our US Soccer Team at the World Cup.